Big Bushkill Creek, Pike County, near Delaware State Forest. 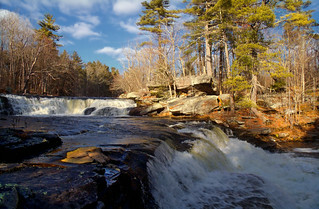 Additional waterfalls, including Resica Falls, are found downstream. High Falls, noted on topographic maps, is several miles upstream. The stream carries a substantial volume of water year-round because of numerous tributary streams and the extensive lakes, ponds, and wetlands at its headwaters. The informal name Big Bushkill Creek is more widely recognized than the the US Geological Survey's official name Bush Kill. (Confusingly, another stream named Bush Kill is in far northern Pike County.) An antiquated, lesser-known informal name is Indian Cabin Run.